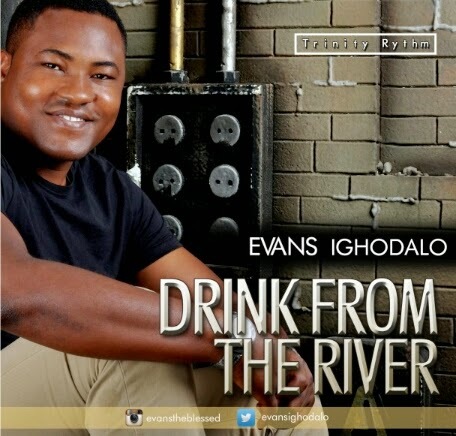 Evans Ighodalo sets off his recording career with the release of his debut single “Drink From The River”, a song that expresses his desire of God who is at work in His life; Produced by MacRock and Greenwox. According to the Scriptures, Jesus says of whoever believes in Him, “out of his belly shall flow rivers of living water”. “I wrote this song in 2013 after fellowship at a friend’s House James Umokoro, craving for the indwelling and more of the presence of the Holy Spirit. Evans Ighodalo (popularly called Evans) is a Nigerian born Gospel artiste from Edo State Nigeria, the second child out of four children born by Cameroonian Mother Benedicta Ighodalo. At the age of 18, Evans started singing at the Redeemed Christian Church of God (Jesus Embassy) Ibadan, and was really encouraged by his Dad who bought several worship cassettes for him. Blessed with song writing and composing skills, he has authored several songs including his just released single “Drink from the River”. Evans has sung on the same platform with artistes such as Bob Fits, Don Moen, Wale Adenuga, Kunle Ajayi, Tye Tribett as well as Frank Edwards, Tasha Cobbs and Nathaniel Bassey. He has served at the RCCG Jesus Embassy worship team for seven years as Praise Worship leader alongside Yetunde Are, Babatunde Ogunseinde, Seun Adelanwa, Ayomide Oketola, Damilola Joshua, Seun Are, who were regular at the Holy Ghost convention at the Redemption Camp. During his University days, he served with Crystal Sound (official choir of Father’s House, Abeokuta) and now currently serves with the Avalanche of the common wealth of Zion Assembly, COZA Abuja. He is married to Oluwatobiloba, and they are blessed with two children, Joanna Oseremen and David Ehijiemhen Ighodalo.